Cantorei is German/Latin for, simply, “Church Choir”. The name reflects the mission of this ensemble: to lead the rich heritage of music sung at the worship. In addition the Cantorei sings repertoire from a variety of traditions: chant to Gospel, Renaissance polyphony to modern-day compositions. This group leads music at the 8:15 am Sunday service. Music is mostly unison (melody) and very singable – a good group for those who haven’t always been in a traditional choir. The Children’s Choir is open to children in grades K-6. The organ built for Central Lutheran Church by the Hendrickson Organ Company, St. Peter, Minnesota, was installed in 1994. It is that firm’s Opus 87 and one of their largest instruments ever. 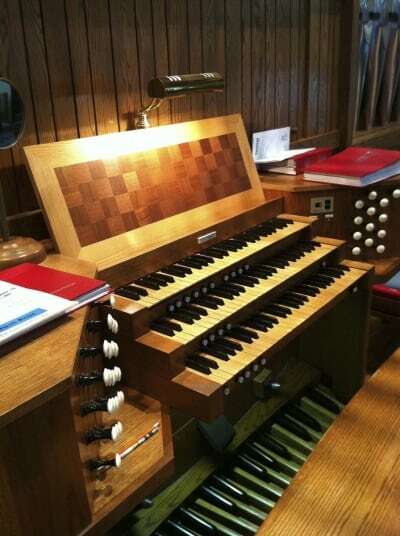 The instrument’s 1,905 pipes are organized into 28 stops, 39 ranks across two manuals and pedal. A third manual acts as a coupling manual (Swell to Great). The organ is housed in a case of red oak, stained to match the furniture of the church interior. all of the oak was grown in Minnesota and Wisconsin. After sawing, the oak was dried for three years in the Hendrickson warehouse and kiln. All of the sawing and milling was done in the shop. The organ has tracker key action and electric stop action. A multi-level memory system allows the organist to select stop combinations with and ease and flexibility. A 3/4 horse-power blower supplies the air for the pipes through three regulators inside the case. A rectifier supplies 15 volts DC for operating the electrical equipment. The organ is arranged in three main divisions. Directly above the keyboards are the shutters for the expressive Swell division which is played from the top manual keyboard. at the top-center of the case is the Great division which is played from the middle manual keyboard. At the sides are the two tall towers of the Pedal division which is played by the feet. These towers contain the largest pipes of the organ. The bottom manual keyboard is a coupling keyboard which plays the Swell and Great divisions together. The 1,905 pipes of the organ are made from Tin, Lead, Zinc, Oak, Aluminum and Mahogany. These were made in St. Peter Minnesota; Zeist, Holland; Freiberg, German and Rapid City, South Dakota. The sound of the pipes was regulated and tuned in the church after voicing in the Hendrickson shop. The organ is supported on a steel frame, welded and bolted together and then shimmed up level. The organ weighs about 7 tons. The decorative pipe shades which fill the space above the pipes symbolize water in its various forms. Rain, to river, to baptism. The shades were designed by Charles Hendrickson and carved in the shop. The organ was inaugurated November 12, 1994 in a recital by Ruth Tweeten, guest organist.